By the time cartridge-filling fountain pens began to become popular in the 1950s, the basic idea had already been around for several decades. The pen above utilized a glass ink cartridge; it was made by the Eagle Pencil Company of New York under U.S. Patent 426,758 of 1890, illustrated below. The Eagle patent would have expired in 1907, but the next serious attempt to manufacture a cartridge pen does not seem to have taken place until the 1920s. The John Hancock cartridge pen was made in Boston, and used ink cartridges made out of copper tubing. The copper was quite thin, which is why the example below is dented where it was pinched while being either inserted or removed. 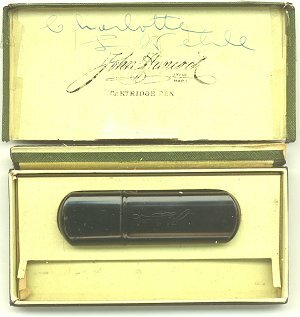 John Hancock pens appear not to have been widely distributed, and it is likely that production continued for only a few years. Cartridges came in at least two lengths, with stamped metal holders provided to carry extras. In 1936 Waterman's French subsidiary, JiF, introduced a line of pens that used glass ink cartridges. Most of these pens bear the imprint, "MADE IN U.S.A." Though some maintain that they were modified in France to accommodate the cartridge filling system, close examination demonstrates that many key components must have been specially made in the USA to French specifications. While the earlier JiF cartridge pens closely resemble the 3, 3V, 32, 92V, and their kin, later examples such as the pen below are more distinctively French in their styling. It was not until the advent of plastic cartridges, however, that cartridge-filling pens became truly popular. The great disadvantage of cartridges of glass or metal was their rigidity, which meant that early cartridge pens required a special sealing fitting at the back of the section. This fitting was typically of cork or rubber, and would deteriorate over time. More flexible, self-sealing modern synthetics such as polyethylene meant that the cartridge could do the sealing, instead of the pen. Molded plastic, too, was much cheaper to manufacture, and could be held to very tight tolerances. The Waterman C/F of 1953 was the pen that introduced the modern plastic ink cartridge. Styled by famed automotive designer Harley Earl, it proved a great success and cartridges remained widely available up until quite recently, especially in Europe. The 1950s were a bad time for Waterman in the USA, so most American C/F pens were economy models, more often than not fitted with steel nibs. Pens sold by Waterman France, by contrast, were typically metal-covered, and into the 1980s competed in design, quality, and price with such higher-end pens as the Parker 75.